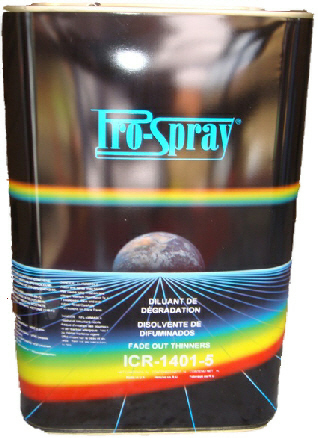 Prospray Fade Out/ Blending Thinners was developed for use with all paint systems. It is specially formulated for dissolving the overspray and fade out the edge created during spot repairs or blending to make fading and blending clearcoats easy. No more dry, patchy edges or visible repairs. SP-UMTH-400 Fade Out/Blending Thinners can be added to 2 component Clearcoats or 2 component Acrylic paints for undetectable touch-ups and blends. In short, it gives you outstanding results and high customer satisfaction. DIRECTIONS FOR USE For all 2 component Acrylic paints and clearcoats, the application remains the same. 1. Add to the ready to spray paint up to 100 parts by volume Fade Out/ Blending Thinners. 2. Apply 1 coat over the overspray edge, fading out into the still intact existing finish. 3. Allow 2–5 minutes flash time after completing the fade out. 4. Use pure Fade Out/ Blending Thinners to dissolve the fade out edge, spray one thin coat. 5. Allow for 15 seconds flash off and apply one final thin coat.